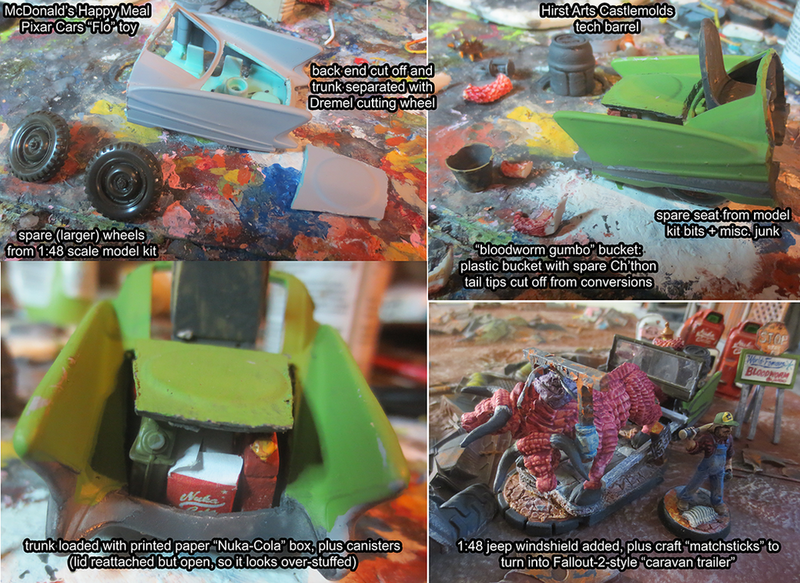 A few WIP photos of the construction of a caravan trailer inspired by Fallout 2. In short, a "caravan" would be represented by a few big-finned back-ends of retro-futuristic cars chopped off and converted into wagons, which would then presumably be towed by Brahmin teams. Given the nature of the Fallout 2 engine, we never got to see any of them in action, and I suppose it would have been too much trouble to model them in Fallout 3 onward, so they never appeared again since. 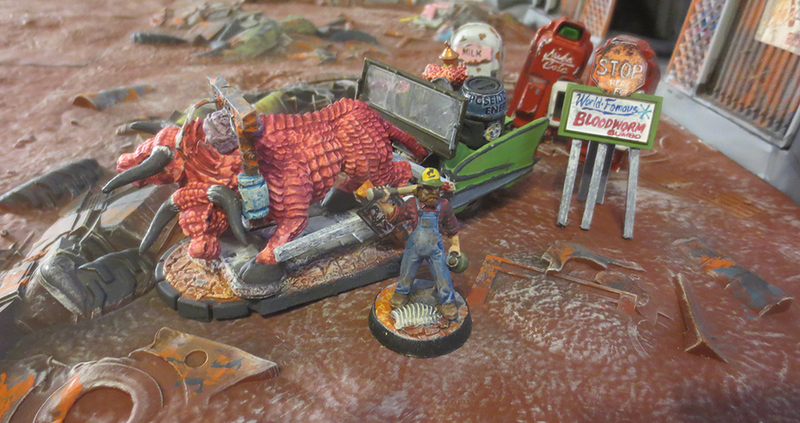 I think that's a pity, since I loved how the sight of half a car chopped off and towed by a two-headed mutant cow pretty much encapsulated the better parts of the post-apocalyptic retro-futuristic aesthetic of the Fallout series. In this case, I took a McDonald's Happy Meal "Flo" toy (from Pixar's "Cars"), disassembled it, removed the windshield and "eyes" insert, then used a Dremel cutting wheel edge to saw off the back half of the car, and to cut out the trunk lid. "Flo" and "Ramone" are rather low-riding cars, so that wouldn't do for a Brahmin-pulled trailer going across the wasteland -- and therefore I jacked up the trailer a bit by installing a couple of larger-diameter plastic wheels from a collection of WWII model "bits" I have in a bag. I added a spare windshield from a broken Jeep model, used some craft wood "matchsticks" for the main harness structure, and then inserted a plastic peg under the rear section so the wagon can stand up better when being portrayed as being pulled by the mutant bull. I put a few random junk items in the trunk (canisters, papercraft box), put the lid back on top of that (so as to appear over-stuffed), and then stuck some more junk atop THAT. I had a bunch of leftover tail-tips from the "Ch'thon" conversions I did for bloodworms, so I had the inspiration to stick them in a bucket and turn this into a food vendor -- "bloodworm gumbo" sounded good, so I made a little sign to accompany the wagon. The merchant is Reaper Chronoscope #50291 "Billy Bob, Zombie Hunter." His pack animal is #77256 "Brass Bull," but with a second head and with a harness crafted out of sprue and junk, with a bit more putty, as a mutant bull. In the background are some 3D-printed vending machines I fixed up, and the scenery consists of a "Toy Story" waste-disposal plant play set, and some Secret Weapon Miniatures Tablescapes "Scrap Yard" tiles. For the "Brass Bull"/"Mutant Bull" base, I used a plastic 40mm square base combined with a HeroClix dial that I split in half, then affixed to each end, braced both by the integral base of the "Brass Bull" model, and a bit of putty. The scenery consists of Secret Weapon Miniatures Tablescapes "Scrap Yard" themed tiles, plus a "Toy Story" play-set I turned into a wrecked building / settlement entrance gate. The crate on the back is a Hirst Arts Castlemolds casting, with some printed paper elements for the warning signs. The "Big Book of Science" is printed paper glued to a scrap of balsa wood. The canister is a random "bit" from a model kit. The teddy bear was made with some leftover bits of putty I had mixed up, that was starting to harden. For the main body of the bear, I rolled a ball of putty, and then I made the limbs with "teardrops" of putty pressed into position. For the head, I made a "kidney bean" shape (impressing it with the side of a paint brush where the "nose bridge" would be at the top of the muzzle), and then I used the rounded back end of a paint brush to make soft concave areas where the eyes would be. The eyes themselves aren't sculpted -- they're just dots of paint -- and ditto for the button nose and the simple mouth. The ears were made from tiny "worms" of fresher putty I was able to curl into C shapes and then press onto the head. There's no wire skeleton frame for the "figure," so it ended up being warped this way and that as I applied bits of putty. The horse is from a Safari Ltd "Horse Toob" set -- a collection of plastic horses I picked up at JoAnn Fabric a while back, because they're in the rough ballpark of 32mm scale, AND they haven't any saddles or caparisons or barding or other features that would lock them into a particular time period or fix them into a role as riding animals. I made the air filter cylinders by chopping a couple of slices off of a piece of plastic sprue and drilling a few holes in the end, then pin-drilling attachment points at the edges of the horse's mouth, and affixing with small sections of wire. I made the gas mask lenses by putting a dot of super glue over each eye, applying a tiny ball of putty there (I took care to make sure both balls of putty were the same diameter), then I took the flat end of a round length of plastic sprue and impressed that into each ball of putty; the putty that just squashed outside the diameter of the sprue cross-section made a "rim" for each goggle lens. Technically, a HORSE is something you just don't see in Fallout. I think the "Fallout Bible" working doc flat-out states that there ARE NO horses in the Fallout world ... but then, I think it says the same thing about cats, and yet a bunch of them popped up in Fallout 4, and there's a Fallout: New Vegas tie-in comic that shows NCR troopers on horseback. So maybe those cats don't exist according to canon, and maybe those horses don't, either, but past a certain point that's just silly, and I WANT A HORSE OF THE APOCALYPSE, so there it is. I've got another caravan trailer in the works that has ANOTHER horse, but this time it's got a bit more of a Fallout mutant vibe to it. There will be more on that once I get a good picture of it. I didn't find any cheap plastic cows of the right scale to work with since the last trailer, so this time around, it's another horse. However, I decided to make it a little more Fallout-esque, by granting it the same mutation that seems to plague so many post-apocalyptic herbivores: two heads! Just to make things even weirder, the right head of the mutant horse has two eyes on the right side of its face, and none on the left. Do you have a Michael's near you? I remember them selling the horse toob. Unless that entire set has been phased out. Do you have a Dollar Tree, or some other store that sells everything for a single dollar? My local store has bags of animals, I think one was just horses. 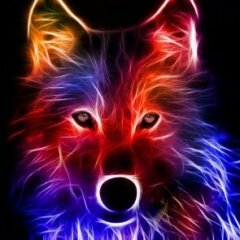 I won't get free until Friday morning to go check exactly what they have. @Brother Jim: Any time I have an opportunity to check out a dollar store, I make a beeline for the small, cheap toy section. ;) I was able to score a decent (for $1) plastic Conestoga wagon that way (or something to roughly approximate it), even though the included cowboys and Native American warriors were closer to 54mm scale. However, all the cows I've found so far have *also* been the sort that would look more at home with 54mm scale than 32mm. Thanks for the suggestion, though! I'm pretty sure I've seen plastic cows of an appropriate size some time in the distant past ... but, alas, that was during a time when I didn't think I'd have a "need" for them. @pcktlnt: Follow-up -- I went by Michael's today, and -- sure enough -- they have Safari Ltd "Toob" sets! I'm disappointed to say that the quality has decreased a bit, and the price I'm pretty sure is higher. I found two sets with a cow: one was "Down on the Farm," and another was just "Farm." Both were $12, and each one only had one cow. (One also had a BULL, but for whatever reason any time I see a Brahmin in Fallout, it's a cow, so somehow putting a BULL there just wouldn't seem fully iconic. ;) ) As for the quality-decrease, I'm talking about the pre-paint job. Last time I got "Down on the Farm," the tractor and trailer included in the set had painted tires and a couple of other details. Here, the trailer was just solid red -- tires and all -- and the tractor only had a haphazard black applied to part of the tires (still red hubs, and the whole engine area was left red as well). I suppose I shouldn't care that much since I plan to repaint these, but when I see "cheaper" product and higher price, it's disappointing. Fortunately, I checked and there was a "40% off any one item" coupon at Michael's, as apparently they follow the same coupon model as JoAnn Fabric. So I just got that one item. ;) With tax, it amounted to a little under $8. Thanks for the tip! I went for the "Down on the Farm" set again, since the tractor and trailer are about the right scale to work as scatter terrain -- and I could even turn the trailer into a *smaller* wagon for the merchant caravan (maybe pulled by a donkey -- since there's a dead donkey named Pugsley in the first Fallout, so at least *donkeys* must be okay in the Fallout universe). Maybe I can use the rooster for some sort of a "Chicken Shack" fast-food place -- or even a merchant stall (with the implication that the over-sized chicken statue has been salvaged from a fast-food joint). Right now I've got a second head in the works. I think I will go ahead and make a "cargo load" for the brahmin, but this time around it's going to be a *removable* load, so I can either use the brahmin as a wagon-puller, or else as a solo cargo-carrier. I did this recently. My local dollar store had them in with the party favors. I also got a set of basketball players and debates on some baseball but the extra height (35-40mm) made more sense for basketball. Maybe I can use them for standin goliath and firbolg too.